The Archbishop of Westminster Cardinal Vincent Nichols has offered his congratulations to Prince Harry and Meghan Markle after their engagement was announced by the Prince of Wales earlier today. He tweeted: "I offer my congratulations to Harry and Meghan on the news of their engagement. We pray for their happiness as they prepare to make their life-long commitment to marriage." The Archbishop of Canterbury Justin Welby tweeted: "I’m absolutely delighted to hear the news that Prince Harry and Meghan Markle are now engaged. I wish them many years of love, happiness and fulfilment – and ask that God blesses them throughout their married life together." Photographed this afternoon in the Sunken Garden at Kensington Palace in London, Prince Harry told journalists he was "thrilled, over the moon". Asked when he knew Miss Markle was the one, he said: "The very first time we met." Miss Markle, a star of the television drama "Suits", showed her diamond engagement ring and said she was "so very happy, thank you". 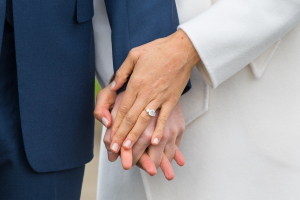 The ring was designed by Prince Harry himself, using two stones from the jewellery collection left by his mother, the late Diana, Princess of Wales. The stone in the centre is from Botswana, a country Prince Harry has close links to, has visited several times and where the couple have spent time together recently, according to Kensington Palace. Meghan Markle was not brought up as a Catholic although she attended a Catholic school. She has been married before, in 2011 to film producer Trevor Engelson but not in a church ceremony. They split in 2013. She gave a recent interview to Vanity Fair which in the resulting article noted that if she and Prince Harry did go ahead and commit to spending their lives together, she would be the first American to marry into the royal family since Wallis Simpson wed King Edward VIII, leading to his abdication over eight decades ago. The sunken garden contains a memorial created in memory of Princess Diana to mark the 20th anniversary of her death. The Queen and Duke of Edinburgh said they were "delighted" and wished their grandson, who is fifth in line to the throne, and Miss Markle "every happiness". Miss Markle is expected to be created an HRH and a Ducbess. They will live in Nottingham Cottage in Kensington Palace. The wedding is expected to take place next spring.